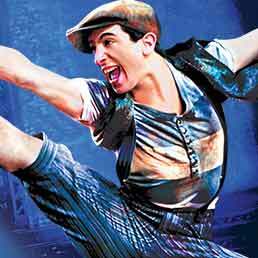 Straight from the Broadway stage, Fathom Events and Disney Theatrical Productions are thrilled to bring the Tony Award®-winning musical NEWSIES to cinemas nationwide. Filmed live on stage at the Pantages Theatre in Hollywood, CA, this not-to-be-missed high energy show stars Original Broadway cast members Jeremy Jordan as “Jack Kelly,” Kara Lindsay as “Katherine,” Ben Fankhauser as “Davey” and Andrew Keenan-Bolger as “Crutchie”. They’re joined by North American Tour stars Steve Blanchard as “Joseph Pulitzer,” and Aisha de Haas as “Medda Larkin,” and Ethan Steiner as “Les” along with members of both the Broadway and North American Tour ensembles, filling the stage with more “newsies” and more dancing than ever before. CITIZEnS OF NEW YORK - Mark Aldrich, Bill Bateman, Tommy Bracco, John E. Brady, Joshua Burrage, Kevin Carolan, Ben Cook, Michael Dameski, Julian DeGuzman, Nico DeJesus, JP Ferreri, Sky Flaherty, Kaitlyn Frank, Michael Gorman, David Guzman, Jacob Guzman, Stephen Hernandez, Meredith Inglesby, James Judy, Beth Stafford Laird, Devin Lewis, Eric Jon Mahlum, Nicholas Masson, Anthony Norman, Andy Richardson, Michael Rios, Jordan Samuels, Jack Sippel, Daniel Switzer, Andrew Wilson, Chaz Wolcott, Iain Young, Anthony Zas.